Plough Publishing House, 9780874860818, 160pp. Years after her death, a poet's life and work speak across the generations, inspiring new music and more intentional living. 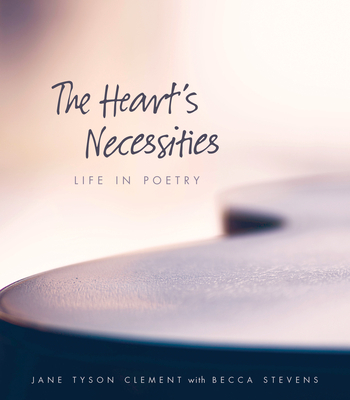 What are the heart's necessities? It's a question Jane Tyson Clement asked herself over and over, both in her poetry and in the way she lived. The things that make life worth living she found in joy and grief, love and longing, and, most importantly, something to believe in. Her observation of the seasons of the soul and of the natural world have made her poems beloved to many readers, most recently jazz artist Becca Stevens. Clement's poetry has gained new life - and a new audience - as lyrics in the songs of this pioneering musician of another century. Like many great poets, from Emily Dickinson to Gerard Manley Hopkins, Jane Tyson Clement (1917-2000) has found more readers since her death than in her lifetime. A new generation that prizes honesty and authenticity is finding in Clement - a restless, questing soul with a life as compelling as her work - a voice that expresses their own deepest feelings, values, and desires. In this attractive coffee table collection of new and selected poems, editor Veery Huleatt complements Clement's poetry with narrative sketches and scrapbook visuals to weave a biography of this remarkable woman who took the road less traveled, choosing justice over comfort, conviction over career, and love over fame.